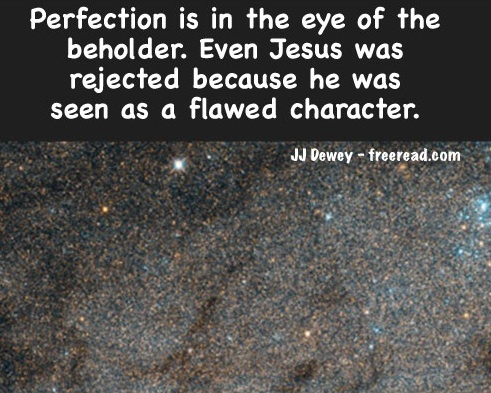 Another reason that people accept Jesus as God is because they see him as being perfect. This we shall show as another illusion. Actually, there are more scriptures that talk about the perfection of the saints than that of Jesus. There are two scriptures referring to perfection in relation to Jesus. The second word is KATARTIZO. This word means to complete or finish, but in a different sense. TELEIOO has the implication of finishing a new work or effort one has taken on whereas KATARTIZO implies a restoration to something as it was in the past. Both words imply wholeness, but the first through a new task, the second through a restoration. When the Bible believing people of today talk about Jesus being perfect they usually use the word in the same sense that AKRIBELA was used. That is they think that Jesus obeyed all the laws “exactly” . They think of his perfection in the sense that he never made one mistake, that he never broke one commandment and exactly obeyed every injunction from the Bible. He was beyond reproach. The word for perfect here is TELEIOO and is the one used in connection with the perfection of Jesus and has nothing to do with obeying the law thus the law cannot create TELEIOO, or the perfection of Christ. Here Paul boldly states that Jesus was not perfect (or AKRIBELA) because he broke the law by his very death. The Old Testament which Paul quoted stated that anyone who was hung on a tree (or cross) was “accursed of God”. (See Deut 21:23) Therefore Paul explains that if righteousness comes by the law then Jesus was cursed because he was crucified on a cross made from a tree. Why do you suppose it was in the plan of God that Jesus violated the law of perfection (AKRIBELA) to the extent that he was to be “accursed of God” by his very death. After all he permitted it to happen. Was it so we would look forward to something else besides a black and white interpretation for our salvation? If this is so, why do we put Jesus on a pedestal by saying he never broke a law? Why do we think of him as AKRIBELA (perfect) when he was not? In other words if one follows the law of love, or the spirit, he may wind up breaking the letter of the law and the prophets. Almost everyone, for instance, would be forced to break the letter of the law under a ruthless dictatorship. If authorities came looking for one’s child to execute him what parent would not lie to some degree to save his child from unjust suffering? In this case a lie breaks the letter of the law, but fulfills the law of love. Exceptions as this can be found for every commandment as was well illustrated by Solomon when he said there was a time for every purpose under heaven. Those who persecuted Jesus were of the mentality that believed one should obey the law regardless of who was hurt because the law was the law. On the other hand, Jesus guided his life with the question: What action can I take that will produce the most good and show the greatest display of love? These two modes of thinking are in great variance and a clash was inevitable. The sin that Jesus was accused of most frequently was that of breaking the Sabbath. Here is an example: “At that time Jesus went on the Sabbath day through the corn; and his disciples were an hungered, and began to pluck the ears of corn, and to eat. But when the Pharisees saw it, they said unto him, Behold, thy disciples do that which is not lawful to do upon the Sabbath day (they were harvesting corn). But he (Jesus) said unto them, Have ye not read what David did, when he was an hungered, and they that were with him; How he entered into the house of God, and did eat the shewbread, which was not lawful for him to eat (David broke the law by eating the sacred bread to save his life), neither for them which were with him, but only for the priests. Or have ye not read in the law, how that on the Sabbath days the priests in the temple profane the Sabbath, and are blameless? (Then priests had to work to offer sacrifices). But I say unto you, that in this place is one greater than the temple (The Christ). But if ye had known what this meaneth, ‘I will have mercy, and not sacrifice’, ye would not have condemned the guiltless. For the Son of man (all of us are sons of men) is Lord even of the Sabbath day. Here the Jews thought Jesus was far from perfect because he allowed the harvesting of grain and worked at healing on the Sabbath. Both of these actions were considered to be contrary to Jewish law as written by the prophet Moses..
On two occasions Jesus cleared the money changers out of the temple. He scattered the sheep, oxen, and birds. He overthrew tables, scattered money all over and caused considerable loss of revenue, destruction and distress to the workers there. In today’s society he would be violating at least a half a dozen laws of the land, and he undoubtedly broke a few there too, but again he did it in obedience to the law of love and respect for his Father whom the temple was supposed to honor. Again we see that Jesus was not perfect, or AKRIBELA, in obeying the letter of the law. The word “blasphemy” comes from the Greek BLASPHEMIA which literally means “a hindering or hurtful statement” or “a harmful unfounded statement.” To receive the death penalty the Jew had to make a disrespectful or insulting statement against God, his name, or something sacred that was associated with him. One of those things was the temple. One could be put to death for blaspheming it. This was the first life threatening “sin” that Jesus committed. In reality he was referring to his body which would be resurrected, but he intended them at that time to think he was talking about the temple. This created the grounds for an accusation brought against him at his trial. A witness stated: “This fellow said, I am able to destroy the temple of God, and build it in three days.” Matt 26:61 Even though the witness slightly misquoted Jesus this statement of the Christ was still bordering on blasphemy according to Jewish law. They certainly felt that he made an unfounded statement, but this was not enough to make them consider taking his life. Here we see that the Jews felt he was guilty of blasphemy and could justifiably stone him to death. Jesus continues as we have previously quoted to tell the Jews that men were called gods in the Old Testament and that it should be no big thing that he would call himself a Son of God. Then they tried a second time to kill him, but he escaped. Jesus sealed his fate when he committed blasphemy (in Jewish eyes) in front of all present at his trial. Here he gave them what they wanted to hear: a reason to put him to death. Jesus was accused of three things: (1) Being a glutton, (2) a winebibber (a drunk), and a (3) friend of publicans and sinners. Now some religions think that Jesus drank fresh grape juice, but no serious scholar accepts this for there is no evidence of it. There was no way to store fresh grape juice in those days. Thirdly, Jesus was strongly criticized for being a friend of publicans and sinners. A publican was a tax collector and Jewish opinion was much lower toward them than the public today have toward IRS auditors. They were looked upon almost as traitors. The sinners included prostitutes, good time Charlies, and other non pious, non synagogue-attending people of various grades. Imagine what the New Christian Right today would think if a man like Jesus walked among us. If he were to mingle incognito with them and treat them like the ancient Jews he would take no precautions to appear religious or pious and would disregard many of their teachings as well as introduce many new and strange doctrines. Could such a man be accepted by the pious of today? No. Never. If a controversial man like Jesus were to perform miracles among the fundamental religious people of today would they give the glory to God or would they be as the Pharisees and say: “This fellow doth not cast out devils, but by Beelzebub the prince of devils.” Matt 12:24 In other words: This fellow performs his miracles by the power of Satan and not God because he does not agree with us. The Bible, as we can see, definitely teaches that Jesus was not perfect, or AKRIBELA, and did not follow the law and the prophets with exact precision as many think. He did without fail follow the law of love in every action and that is the important thing. No black and white law such as the law of Moses is correct in every circumstance. The law of love makes many exceptions and Jesus made a point to illustrate the exceptions so men and women could truly learn to recognize good over evil. He came to prepare the way for the fulfillment of the prophecy: “I will put my law in their inward parts, and will write it in their hearts; and will be their God.” Jer 31:33 Jesus was the great example of a man, who was a Son of God, with the law written in his heart. Finally we discover the type of perfection Jesus was. He was TELEIOO (Literally TELEIOEIS denoting the tense in this script). To understand Jesus more correctly we need to examine in greater depth the meaning of this word. “Perfect” is not the most literal translation of TELEIOO, even though the Bible translators often render it so. It is more correctly rendered “finished”, accomplished, or completed”. In this last reference “author” is more literally translated as “beginner”. The thought expressed here is that Jesus is the beginning and end of our faith. One can see from these references that the general meaning of the word is “to finish a job or project one has been given to do.” The closest one word interpretation would be “finish” not “perfect”. For instance Jesus spoke of “the works which the Father hath given me to finish” (TELEIOO). The scripture we quoted as translated “being made perfect” (all three words are from the one Greek – TELEIOO) could be translated as “finishing his job,” “having accomplished this,” being complete, or “fulfilling this”. Amazingly, this scripture by itself clearly tells us that Jesus was not perfect throughout his entire life – as the religious world defines perfection. It says: “yet LEARNED he obedience by the things which he suffered.” This tells us that there was a time in his life when he had not yet learned obedience and that he suffered for it. This reference tells us that Jesus came closer to perfection (as we use the word today) after he suffered. If he was perfect (AKRIBELA) from start to finish then why did he have to suffer to learn obedience? Many Christians today have the idea that Jesus was so perfect that he never made one mistake, that he did not have to learn obedience but it was automatic with him because he was God. Why should God have to learn obedience from God? They think that he completely and literally obeyed every injunction in the Bible, and that he was a rigid lawkeeper. As we can see, this has no basis in the Bible. The Bible does, however, show us that he was the most perfect expression of love that ever walked the earth. “Finish therefore what is expected of you, even as your Father which is in heaven accomplishes that which is expected of him.” This is a commandment we can live with and appreciate and is much more applicable than an injunction to be flawless as is the One God who holds the universe together and created all the millions of galaxies. That is like telling a worm to be like a man. That is impossible, but the worm does his job assigned to him by nature just as do the higher animals. In this way all living things are perfect as the Father is perfect if they follow the harmony of nature. We are also told that the beasts share the One Spirit: “For that which befalleth the sons of men befalleth beasts; even one thing befalleth them: as one dieth, so dieth the other; yea, they all have one breath.” (Spirit) Eccl 3:19 In addition Moses called God: “the God of the Spirits of ALL FLESH.” Num 27:16 Since all flesh shares his Spirit and the whole earth is full of his glory we know that all living things, even the plant kingdom and the earth itself has some contact with the One Spirit. We could then say that a flower which displays beauty and a wonderful fragrance is fulfilling the purpose for which God made it and is thus perfect as our Father in heaven is perfect. In the same way, if men and women fulfill the purpose toward which the One Spirit guides them, then they are perfect as is our Father God. It is commonly accepted by the Christian world that Jesus was the only perfect man, and the only one who never, never made a mistake of any kind, and the rest of us are condemned. They look on perfection as “not doing” rather than “doing”. With Akribela you do not do wrong things. With TELEIOO you do your job until it is completed. It sounds here like any of us can become faultless before God. If Jesus were faultless before God and we are too what is the difference? Obviously, we are faultless if we do the job we came here to go and experience the growth and service that God has in store for us. Paul obviously expected many to attain perfection: “We may present EVERY MAN PERFECT in Christ Jesus.” Col 1:28 Again “perfect” comes from TELEIOS. If we fulfill the purpose for which God made us, even if we make mistakes along the way we are perfect or TELEIOS. Paul merely wanted every person to fulfill his part in the plan of God just as Jesus had done. Obviously, the scriptures clearly teach that we are not to think of Jesus and his Father as merely Gods that we are to only worship, but not follow. We are clearly commanded to be “holy” and “perfect” just as they are and if we manifest the same Spirit of the one God that they do then we are Gods in the same way that they are. As we see the perfect day we realize that we can never be “one” with Jesus and his Father if we think of them as being entirely different than ourselves. How can we be one with something separate, different, or overwhelmingly superior to us? We can only be “one” with God if we are like him “in his image” as the scriptures say. Maybe it is time for believers to ask themselves if they really believe what the Bible says about man and God. Or does humanity just believe what they want to believe? Behold, I am he that gave the law, and I am he who covenanted with my people Israel; therefore, the law in me is fulfilled, for I have come to fulfil the law; therefore it hath an end. Hence Pauls remark that the law that NO MAN is justified by the law in the sight of God again for all….have fallen short of the glory of God and hath sinned?